Detail from Anon. "Les Journaux en mai 1815"
These two details from anonymous anti-censorship caricatures from 1814-15 show how the opposition liberal press reacted to the crackdown on press freedom by the restored French monarchy. On the left we see a figure representing the liberal journal Le Censeur edited by Charles Comte and Charles Dunoyer. They have broken free of the muzzle and reins of the government censors and continue to hurl lightning bolts and shine the light of criticism on the regime. On the right we see an archer dressed in yellow depicting the liberal satirical journal Le Nain jaune (the yellow dwarf) who fires his critical arrows at representatives of the old order - the chruch, the aristocracy, and the monarchy. The nun representing the pro-church press holds a death's head doll and her speech bubble says "guerres aux idées libérales" (war against liberal ideas). After the strict and heavy handed censorship of the Napoleonic Empire there was a brief period of press freedom during the First Restoration of the Bourbon monarchy under King Louis XVIII (April 1814 - March 1815). The restored Bourbon monarchy declared freedom of the press on 4 June 1814 which led to the creation of a full spectrum of political debate and argument among the 20 new titles which emerged. However, by October 1814 new censorship laws had been passed in order to control political criticism of the new regime. All publications less than 20 pages long (so most papers and journals) had to have their material approved by government officials before they could be published. These laws were made even more restrictive in November 1815. There was another liberalizaton of the censorship laws in late 1818 under the ministry of Dessoles-Decazes with the Serre press laws but this was short lived as the assassination of the Duke de Berry in February 1820 led to a severe crackdown on press liberties. In the wake of this many journals were forced to close, including the liberal La Minerve française for which Benjamin Constant wrote as well as the successor to Le Censeur of Comte and Dunoyer, Le Censeur européen. Freedom of Censure on the Conduct of their Rulers, is necessary for the good of the People. It is perfectly clear, that all chance of advantage to the people, from having the choice of their rulers, depends upon their making a good choice. If they make a bad choice—if they elect people either incapable, or disinclined, to use well the power entrusted to them, they incur the same evils to which they are doomed when they are deprived of the due control over those by whom their affairs are administered. We may then ask, if there are any possible means by which the people can make a good choice, besides the liberty of the press? The very foundation of a good choice is knowledge. The fuller and more perfect the knowledge, the better the chance, where all sinister interest is absent, of a good choice. How can the people receive the most perfect knowledge relative to the characters of those who present themselves to their choice, but by information conveyed freely, and without reserve, from one to another? There is another use of the freedom of the press, no less deserving the most profound attention, that of making known the conduct of the individuals who have been chosen. This latter service is of so much importance, that upon it the whole value of the former depends. The French artist Eugène Delacroix (1798-1863) was very much a part of these intellectual and legal battles on behalf of liberty of speech during this period. Before he made a career as one of the foremost painters in the Romantic School he contributed a number of engravings and caricatures to organs of the liberal press in which he mocked the government censors and the political and social groups they were protecting from criticism. Two of these engravings are discussed in detail below. As the 1820s progressed Delacroix turned more to painting rather than engraving caricatures but he still retained strong liberal sentiments as his paintings supporting the Greek war of independence against the Turks and the overthrow of the Bourbon monarchy in the July Revolution of 1830 indicate ("Massacre at Chios" (1824), "Greece Expiring on the Ruins of Missolonghi" (1826), "Liberty leading the People" (1830)). Historical Background: An important source of information on Delacroix's caricatures in the Restoration period is Nina Maria Athanassoglou-Kallmyer, Eugène Delacroix: Prints, Politics and Satire 1814-1822 (New Haven: Yale University Press, 1991). See also Nina Maria Athanassoglou-Kallmyer, French Images from the Greek War of Independence, 1821-1830: Art and Politics under the Restoration (New Haven: Yale University Press, 1989). Description: After the strict and heavy handed censorship of the Napoleonic Empire there was a brief period of press freedom during the First Restoration. The restored Bourbon monarchy declared freedom of the press on 4 June 1814 which led to the creation of a full spectrum of political debate and argument among the 20 new titles which emerged. 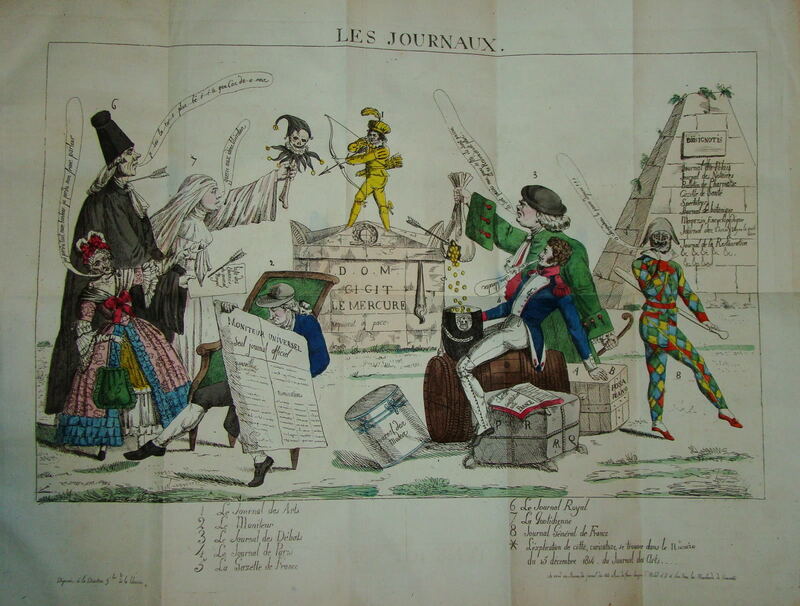 The satirical journal Le Nain jaune (The Yellow Dwarf) commissioned the above caricature for its first issue (15 December 1815) to show the diversity of public opinion under the new regime. Its technique was to personify the various journals as characters who encapsulated in their shape or dress the attitudes of the paper, their readers, or their owners. In the middle there is a tomb with the inscription "Here lies the body of Le Mercure" (a liberal paper which had suspended publication). On the tomb is a yellow figure (Le Nain jaune) which has taken up the liberal cause of Le Mercure and is firing arrows at the strange characters who represent the new press of the Restoration. Note no. 7, Le Quotidienne, dressed as a royalist and nun (representing the paper's interest in defending the aristocracy and the clergy) whose voice bubble states "War on liberal ideas". However, by October 1814 new censorship laws had been passed in order to control political criticism of the new regime. All publications less than 20 pages long (so most papers and journals) had to have their material approved by government officials before they could be published. These laws were made even more restrictive in November 1815. Source: <http://prometheus.khi.uni-koeln.de> This image comes from an online collection of images about revolution called the Lexikon der Revolutions-Ikonographie Justus-Liebig-Universität, Historisches Institut, Gießen. Description: This anonymous coloured engraving appeared in May 1815 after the imposition of the new censorship laws and shows how the press had been "hitched" to the wagon of the state. The various figures representing the journals and newspapers are wearing harness and bit and their reins are held by the strong arm of the censor to the left. Note the yelow figure of Le Nain jaune who is still holding up a torch of criticism and enlightenment but the large shell is about to descend over the journal and snuff it out. The slogan on the side of the shell says "Here lies Le Nain jaune" which was quite prophetic as the journal was closed down in July 1815 and the staff forced to flee to Belgium to escape the police censors. The only exception to this state repression is the journal personified as a classical figure riding the winged Pegasus (No. 8) in the sky to the top right. The journal was the liberal journal Le Censeur written and edited by the classical liberals Charles Comte and Charles Dunoyer who were trained as lawyers and were able to escape the wrath of the censors by various legal subterfuges such as publishing their "journal" as a lengthy book, thus overcoming the size limitation on censored material, and tying the censors up with repeated law suits to block them. We can see here that Le Censeur continues to hurl lightning bolts at the police and shines down rays of enlightenment from its lofty position in the sky. There was another liberalizaton of the censorship laws in late 1818 under the ministry of Dessoles-Decazes with the Serre press laws but this was short lived as the assassination of the Duke de Berry in February 1820 led to a severe crackdown on press liberties. In the wake of this many journals were forced to close, including the liberal La Minerve française for which Benjamin Constant wrote as well as the successor to Le Censeur of Comte and Dunoyer, Le Censeur européen. Le Censeur first appeared in June 1814 before being forced to close in September 1815. It was in suspension until it reappeared under the title of Le Censeur européen in February 1817 and lasted until April 1819. During the hiatus in publication Comte and Dunoyer discovered the writings of the economist Jean-Baptiste Say (1767 - 1832) whose Treatise of Political Economy had appeared in a new and expanded edition in 1817. When they returned to criticizing the regime they had a new arrow in their quiver - added to their previous political and legal defence of liberty they had added a potent economic and historical dimension which was to be very influentiual in decades to come. Most notably on Frédéric Bastiat (1801-1850). In late 1821 and early 1822 there was another weakening of direct and prior (to publication) censorship of the press but a new bill which was passed by the parliament in March 1822 allowed the government to bring to trial journals which it thought were too critical of the government and the church. Before it became clear how the government would use these new powers to control the press, there was jubilation that censorship had been "abolished". Source: The British Museum <http://www.britishmuseum.org>. Description: In late 1821 and early 1822 there was another weakening of direct and prior (to publication) censorship of the press but a new bill which was passed by the parliament in March 1822 allowed the government to bring to trial journals which it thought were too critical of the government and the church. Before it became clear how the government would use these new powers to control the press, there was jubilation that censorship had been "abolished" as these 2 engravings by Delacroix show. Before he became better known as one of France's leading romantic painters Delacroix had shown his sympathy for the liberal cause in numerous works he drew for the periodical press. One of the journals he drew for was Le Miroir (the mirror) which had incurred the ire of the government on many occasions for its depiction of the crown, the aristocracy, and the church and was thus the victim of repeated law suits during 1822 after the new press law was passed. The editor was finally sued, fined and imprisoned and the journal forced to shut down in June 1823. This drawing by Eugène Delacroix (1798-1863) was published when the liberalization of the press laws looked more promising, before the Parliament passed new laws permitting the government to sue publisers for criticism they did not like. It looks forward to the complete abolition of censorship when the censors will be kicked out of their offices and forced to move to some other location to do some other job. A group of jubilant men are waving good bye to the censors as they leave their building on the rue des Saints-Pères which is now up for rent ("maison à louer"). The historian Athanassoglou-Kallmyer believes that the men are asking where the censors are headed and the man standing at the top of the cart is pointing to the devil as if to say "We are going to Hell". Scissors representing the power of the censors to "cut" offending passages out of newspapers have now taken wing and are flying away like a flock of freed birds. The out of work censors are being driven away in a cart which is being pulled by a weary and weak looking donkey the reins of which are held by a devil. The cart is filled with figures who are numbered with a key below the drawing to help identify them. The following description and interpretation comes from the British Museum website: "a devil drives a cart pulled by a struggling donkey, carrying an assortment of figures and symbolic objects, representing censors, away from their headquarters which are now available for rent (indicated by the sign "MAISON A LOUER" nailed over the doorway); winged scissors (symbols of censorship) rise in the air; the identity of the censors is indirectly provided by a key: Marie-Joseph Pain as a sugar-loaf ('Pain-de-Sucre') figure standing on a chair ('La Chaise') representing Lachaize; F.A.J. Mazure as a ruined shack ('Une Masure'); Abbé Barthélémy-Philibert Picon d'Andrezel as 'extreme zeal' ("d'Outre-zèle"); the Academician Rousselle as the popular character 'Cadet-Roussel'; the poet V.A.Vieillard as an old man ('un Viellard' [sic]) wearing a cap and dark glasses; the Ultra journalist of the 'La Gazette de France' and President of the Paris censorship bureau, Jacques-Honoré de Lourdoueix as a heavy goose ("Lourde-Oye") perched on the back of the donkey ('Anonyme' - ie. 'âne')." Description: Conservative royalist politicians were sometimes called "crayfish" by liberal critics because of their clumsiness and the belief that they walked backwards. Here we see a procession of the censors and members of the conservative press going in the wrong direction. While all the young, liberal, and fashionable people are moving to the upper left along the Longchamps promenade in the direction of the unfinished Arc de Triomphe de l'Étoile (Arch of Triumph) which was a monument built to commemorate those who had died in the revolutionary and Napoleonic wars and hence had fought for liberal and reform ideas. Moving in the opposite direction are symbols of the old order: the conical figure of Marie-Joseph Pain (drawn as a sugar loaf) who was the chief censor in charge of regulating theatrical performances (Delacroix was a strong supporter of Rossini and the new school of opera and drama) sits on a chair with a flag showing the censor's scissors; a second crayfish carries on its back 6 figures who are facing the wrong way and who represent other press censors, academicians, and the conservative press. One of these men has a speech bubble which states "En arrière, marche!!!" (Backwards! March!). To the left behind a tree looking on are two men, one of whom is thought to be Delacroix who is blowing a whistle in derision at the people riding on the crayfish.